Reginald William Tricker (known as Reg) was born on 5 October 1904 in Karachi (then part of Imperial India). He moved to England in 1908 with his family. He is first recorded as playing football in 1923 for Beccles Town and Alexandra Park FC before joining Luton in the 1924/5 season. Beccles Town were established in Suffolk after the first world war, winning the Suffolk Senior Cup in 1920 and 1922 – and it is not too big a leap to suspect that Reg was part of that team. Indeed Arsenal.com tell us that Reg was “a keen athlete,” and “the Norfolk & Suffolk 120 yards hurdles champion for two years” which must have been at the same time. Alexandra Park FC were founded in 1898 and within a year undertook a match overseas – in Paris with another two years later, playing at the training ground “Brickfields”, with changing facilities in Bowes Park. We might assume that Reg and family had moved to north London by then and Reg registered with the nearest team. But then his talents were spotted and he moved to Luton in 1924 – then of the Third Division (South), before returning to Beccles, and then moving on to Charlton, another Third Division team, where he settled into league football, playing 41 games over two seasons. Quite what caused these moves is unknown – it may well have been work or the movement of the family. But one way or another Reg was spotted by Arsenal while at Charlton and joined Arsenal from Charlton Athletic for £2,250 on 12 March 1927, before making his full debut just one week later in a 2-1 defeat at home to Everton. This opening match for Reg was the third in a sequence of seven straight league defeats for Chapman’s team – a sequence that included a 0-7 to WHU, a 1-6 to Newcastle and a 1-5 to Sunderland. The defeat to Everton was almost a matter of celebration by comparison. Reg was one of no less than ten players that made his league debut this season – a season which saw Arsenal slip from the second position achieved in the league in 1926, down to 11th, but which also saw Arsenal make it to their first ever FA Cup Final. Arsenal were 12th in the league at the time of Reg’s first game, and he played inside right, the position normally taken by the now-fading Charlie Buchan. For this match, Brain was missing so Buchan moved to centre forward, and indeed scored Arsenal’s goal. Reg was one of five players to lose his place for the next game (Chapman and the team being much more concerned with the FA Cup semi final coming up on March 26, against Southampton), but he did return, this time as centre forward, for the match against Aston Villa away on 18 April – which Arsenal won 3-2. He played again on 30 April, making his goal scoring debut in a 3-0 win against Birmingham in front of 22619. After those seven consecutive defeats it was the fifth consecutive win. His final appearance came on the last day of the season – away to Tottenham. Arsenal won 4-0 with Tricker getting two goals with a crowd of 29,555 looking on. It was Chapman’s first win over Tottenham. Despite that success, and despite the fact that 1927/8 was Chapman’s worst start to a season (a 1-5 defeat to Bury on the opening day) Reg had to wait until November the for a chance to play again – Blyth regularly playing at 10 and Brain at 9. He did however get a run of four consecutive matches – but the results were poor, Arsenal winning only one of them. After playing in the 1-4 away defeat to Man U, Reg went back to the reserves, being called up once more on 9 April to play, and score both goals in the 2-2 draw with Cardiff and then playing in the 0-0 draw with Huddersfield. He made one final appearance in 1928 in a 1-4 defeat to Man City on 22 September. Reg played in the reserves until February 1929 when he was transferred to Clapton Orient for £1,000. 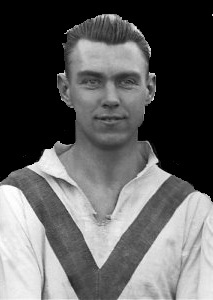 He played for five seasons in East London and was the club’s top scorer for three consecutive seasons between 1930-31 and 1932-33. He then moved on to Margate and possibly Ramsgate, although this move to Ramsgate is only shown on Wikipedia and not reflected in reference books. If Reg stayed in teaching, he would have retired in 1964 – although most sports teachers in the era were then normally found administrative jobs in education as the years progressed. The school was still in Islington at the time, but in 1973 the school moved to Potters Bar. Reg died in 1990, aged 86, although sadly we don’t have a date, or any other knowledge of his life. As always if you have any information please do send it in. 2 comments to Reg Tricker: came from India, signed by Chapman, moved on to Margate. I was at Owen’s Islington in the 1940’s. Reg Tricker was the PT master at the time. We were told he had played for Arsenal, but we didn’t actually believe it, for some reason. We used to joke that he had probably played the gramophone records during half-time. By the way, the name of the school was “Owen’s School’, not “Dame Alice Owen’s school”. Charlie – thanks for the note, and the correction.